Zo found this recipe in Gourmet Magazine. 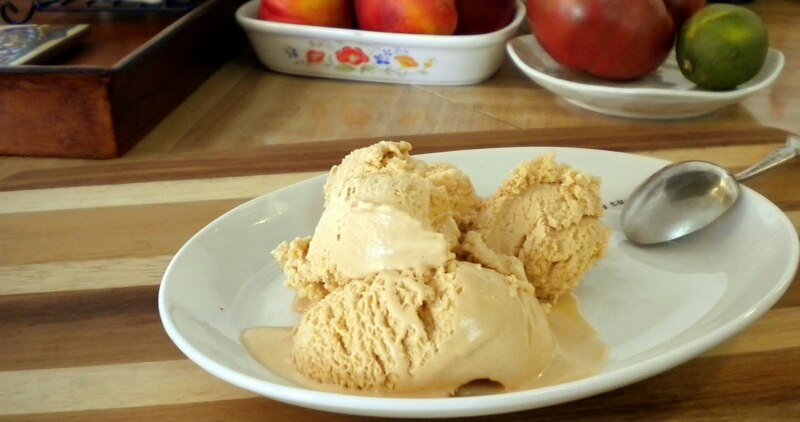 A couple of years back we had some salted caramel and fell in love with the flavor. Zo went to making her own and then came across this recipe and said we would have to make it when she got her ice cream maker attachment. One day an Amazon.com box showed up with an ice cream maker and our tummies have never been happier! Out of all the recipes Zo has created or tried this by far has been our favorite. Every time she has whipped it up it has been a huge hit and everyone wants seconds, even when they know they should not have them! Enjoy! Heat 1 cup sugar in a dry 10-inch heavy skillet over medium heat, stirring with a fork to heat sugar evenly, until it starts to melt, then stop stirring and cook, swirling skillet occasionally so sugar melts evenly, until it is dark amber. Add 1 1/4 cups cream (mixture will spatter) and cook, stirring, until all of caramel has dissolved. Transfer to a bowl and stir in sea salt and vanilla. Cool to room temperature. Meanwhile, bring milk, remaining cup cream, and remaining 1/4 cup sugar just to a boil in a small heavy saucepan, stirring occasionally. Lightly whisk eggs in a medium bowl, then add half of hot milk mixture in a slow stream, whisking constantly. Pour back into saucepan and cook over medium heat, stirring constantly with a wooden spoon, until custard coats back of spoon and registers 170°F on an instant-read thermometer (do not let boil). Pour custard through a fine-mesh sieve into a large bowl, then stir in cooled caramel. Chill custard, stirring occasionally, until very cold, 3 to 6 hours. Freeze custard in ice cream maker (it will still be quite soft), then transfer to an airtight container and put in freezer to firm up. Thanks for the recipe. I'd love to try this out. It is just plain amazing in every way! All three times we have made it everyone has had seconds! It is just too good!